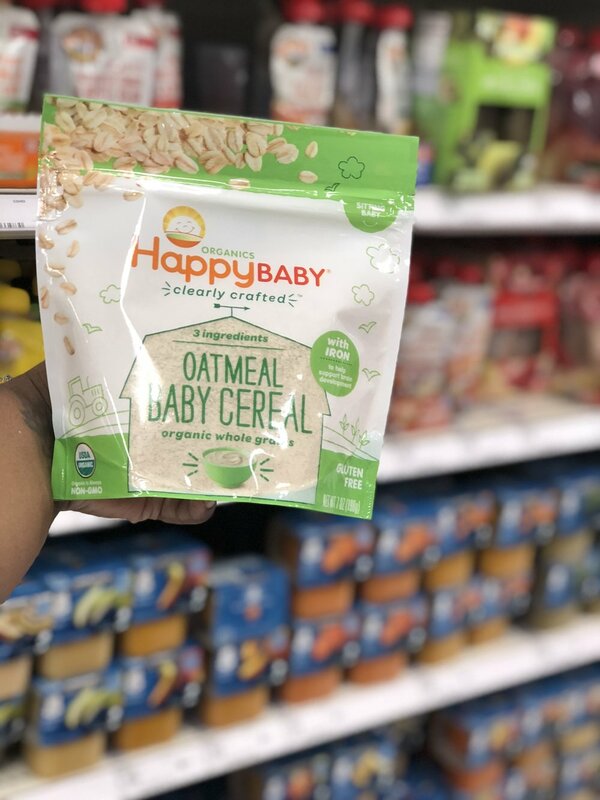 The time is coming where my little one is ready for his first feeding (he is 4 months with terrible acid reflux and his pediatrician recommend we start cereal or oatmeal once a day to help him). Babies are ready to start their first feeding between 4-6 months of age. It is recommended you begin with infant rice cereal or oatmeal for starting solids due to stomach sensitivity. How do I know my baby is ready to start eating solids? Like many things baby will let you know once they are ready for solid foods. Look out for these cues to know if your little one is ready for their first feed. After talking to the pediatrician we decided oatmeal was best to start my baby on solids. Here is why. Rice cereal is made from white rice. Meaning it has zero nutritional value and contains a lot of starch. Which means it is then fortified to contain iron, high levels of folic acid, and many other added vitamins. The problem with this is a baby’s stomach is not yet able to digest most of these at the level in which they are added to the cereals. Rice cereal also contains a certain high level of toxic arsenic. Yes, you read that right! Arsenic is something that is naturally found in soil and water. Due to most farming practices the arsenic can become very concentrated. With the use of pesticides and other field chemicals, this contaminates the soil and local water with arsenic. This water is then flooded over rice fields and rice vs other crops absorbs more of this arsenic . Many copies offer organic rice cereals or cereal made from brown rice, however it is created the same way and not much better than traditional rice cereal. High levels of arsenic can damage the nervous system which can affect your babies brain development. Finding out this information was scary for me as I’m sure it is to you. I immediately looked for other options and found oatmeal to be better. Here is why. Oatmeal unlike rice cereal has a lot of nutritional value. It’s high in fiber, iron, magnesium, and zinc which all aid in your baby’s growth and development. Oatmeal is a single grain food which helps baby to digest easier as well as help with gas and reflux by promoting fullness. Oatmeal is also naturally gluten free and high in protein. Oatmeal, unlike rice cereal, has flavor which helps when mixing with other foods later on. Your choice for your baby is a personal choice. If you have concerns consult your pediatrician before starting solids. For me, after my research oatmeal was the best choice. I also chose to go with organic oatmeal to make sure my baby was receiving the best food option. Here are the organic oatmeal options I recommend. What equipment do I need for My baby’s first feeding? If you are starting your baby on solids as early as I am I suggest getting a support seat with tray like the Bumbo seat. This will help babies with back support while eating. I found these really nice Munchkin First Feeding Spoons. They turn white when food is to hot which is nice to have. Any baby bowl will do. I opted for the traditional Munchkin Bowl. However these Munchkin Stay Put Suction Bowl is great to make sure baby or you do not spill over their food. Constipation-many babies experience constipation when starting solids. Look for signs of food allergies and consult your pediatrician if you think baby may be allergic to something. 3. Starting solids does not mean you are to eliminate giving your baby milk. 4. When first starting solids baby should be fed solids 1-2 times a days and receive milk the rest of the day. 5. Always mix food with breast milk or formula. I think your all set now! Hopefully this helped you make a more informed decision on your baby’s first feed. Enjoy feeding your little one! Share to help another mom out. #ModernMomsclub on Instagram so we can see your little ones.